CES 2009: Sony CEO Sir Howard Stringer demonstrated the world's first flexible OLED technology today during his keynote at CES. Stringer recited the progress his company has made with the technology over the last couple of years and explained that the next step was to create a marketable screen with a "20 to 30 inch diagonal". However, rather than demonstrate the next logical step forwards, Stringer wanted to go one step further with a glimpse into the future. 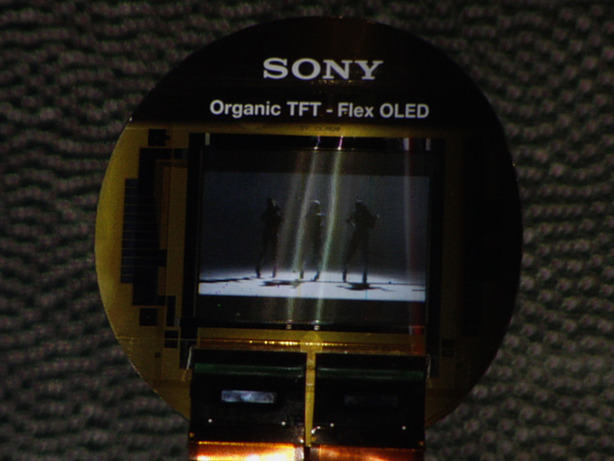 He showed a small palm-sized flexible OLED demo screen playing a Beyonce music video on a podium. Stringer then picked the screen up and squeezed its edges before saying "how many of you would love to squeeze Beyonce like that?" How long had he been waiting to say that? Amazing technology, but it's still a few years out - let us know what you think in the forums. A California-based startup is claiming that its Laser Phosphor Displays - which offer higher viewing angles, better contrast, and no motion blur - represent the future. Mitsubishi has demonstrated a prototype 155" OLED display for commercial use, which is made up of 1.5" square building blocks - and can be made bigger or smaller at will. Kodak's labs have released demonstration images of a flexible OLED display which, in a marked departure from the norm, can operate completely submerged in water.